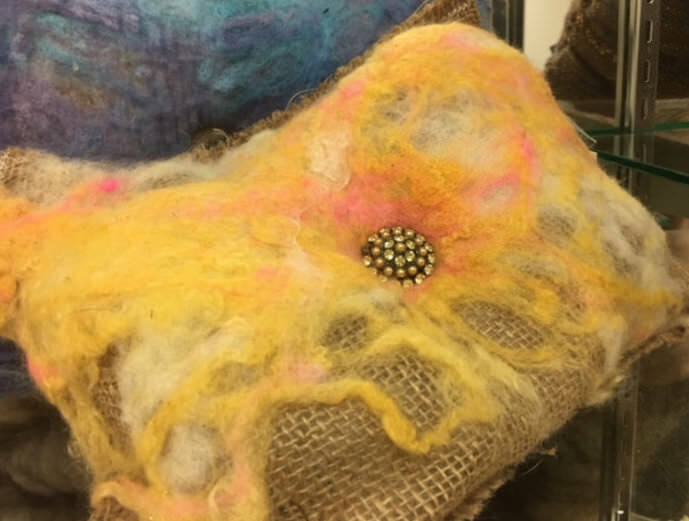 The Charles Town Library will be presenting a gallery talk by Bridget Brown and Susan Shidmyer, two fiber artists whose joint exhibit “From Sheep to Sweater” will be on display in the library’s foyer gallery. Bridget Brown is a versatile fiber artist who uses wool from her flock of fiber sheep to spin, weave, needle felt, wet felt, and create wool paintings. Bridget’s Farm Cart at Head Spring Farm produces fleece for hand spinners and weavers. The exhibit showcases her fleece, yarn, and designs. Bridget is a member of Blue Ridge Spinners and Weaver’s Guild and several sheep breeders associations. Susan Shidmyer is the proprietor of ESYSKnits (Eliminate Susan’s Yarn Stash). Her primary focus is designing apparel and home accessory patterns, as well as producing model garments for garment manufacturers, yarn manufacturers and knitting periodicals and books. As a freelance designer, Susan has designed for Bobby Jones, Talbots, The Gap, Hanai Mori, Timberland, and J. Crew. Susan designs from her home studio overlooking the mountains of West Virginia. The exhibit showcases Shidmyer’s creativity with yarn in various fibers and weights which are combined to form a unique garment. The sweater is art that is worn. Join Bridget Brown and Susan Shidmyer as they discuss their work and art on Thursday, February 22nd at 6:00 pm.